Israel’s nation symbol – the Menorah-is prophetic. On the third night of Chanukah, I was reminded of the meaning of the ‘Menorah.’ The seven lights are the ‘eyes’ of the LORD. They go out and search the earth. The design of each cup that held a light was to be shaped like an almond…again, the shape of the eye. Chanukah is the Hebrew word for ‘dedication. Yeshua Jesus is seen in John 11:20 as standing on the Porches of Solomon reflecting on His dedication soon to occur. He was reflecting back to the days of 167 – 163 BCE when Antiochus Epiphanies defame the Temple and set up the gods of Zeus, Diana, Ba’al, and even Alexander the Great of whom had just died and they declared him a god. Yeshua Jesus knew the Hebrews wanted their Messiach right now…to save them from the Roman crosses that stretched across the country sides. Even Philo, the great Jewish educator from Alexandria, came to Jerusalem around 70 AD to bear witness to his families gold being carried off by the Roman soldiers after the Temple had been set on fire. He probably died defending it. The Temple’s burning may have been done accidentally by the Jews or did the Roman’s want any remembrance to be gone from the land and they did it? Chanukah repeats itself through history as is a pattern for the future. Even Yeshua Jesus said that it would happen again…..It is always about the Temple of God that is at our Creator’s heart. Adom’s heart was deceived and so were his son’s hearts. But, we see a godly lineage coming through the seed of Seth and then through Shem (name). Since we are told to not take the name of God in vain, Jews call him HaShem meaning, The Name. Our name describes us and thus we should take seriously what people call us….or if they damn us by using G-d’s name. We are to be the human temple in which HaShem takes up occupancy in us in the form of His Spirit. On day three of Chanukah the Scriptures on how to be ‘light’ to the world impresses a visual lesson. If the ‘Light’ of the Torah can not go out in the world, then the single light put under a basket can still be seen. It still will shine in a dark world. Some times we feel like we are alone in our quest for righteousness, but Yeshua Jesus says that our light will still be seen. Thus, we continue on even though the original Temple is gone. Philo’s family gold was poured into every molding and crevice and now it is gone. The Menorah was also carried off. General Titus carried the Menorah’s arched wall to Rome. HaShem set it as a memorial to all the earth….and a clear witness to Rome of their destruction to Jerusalem from where The Messiach will declare his reign of the earth which is His footstool. The designing of The Temple Menorah is described as one solid molding. The menorah and it’s utensils weighted 66 pounds of gold; Exodus 37:24. My grandson Caleb, who is almost nine years old, studied this with me and said he was 70 pounds. He seeks the ‘light’ of God to be within him. Perhaps one day he will find a way to join the Israel Defense Force as I know his blood line is Jewish on both my husband and my side. His father and brother are active Air Force reservists for the United States. The physical Temple and spiritual temple are both related. Our spiritual temple should desire to worship in the real (physical) Temple in Jerusalem. As in heaven, as on earth….is the shadow of what is to be. The earthly temple brings the heavenly temple. The Third Night of Chanukah Scriptures: Exodus 25:31-39; Exodus 37:17-27; Zechariah 4, John 1:4-9; 8:12; Revelation 1:12, 23, 20. One of my goals in writing this article was to help define the Hebrew calendar and what it has to do with establishing The Temple in our life time. What does this verse in Zechariah mean to us today? Is the ‘Menorah’ also a main part of our foundation? To reflect Zechariah’s prophecy, the picture of the menorah with an olive branch on either side was chosen to be the symbol of the reborn Jewish homeland. We two things were added to the Menorah….an olive branch on either side. Israel sees The Menorah representing a nation that is to be ‘set apart’ to HaShem of whom gives the ‘light’ to the world. Thus, it is The Torah (instructions) that gives mankind the correct ‘light’ to live by. The Menorah represents The Torah. The oil for the lamp is the Ruach HaChodesh (Holy Spirit). Without being filled by the Ruach HaChodesh, men do not understand the need for the lamp (menorah). Israel’s symbol of the menorah is not complete without the two olive branches. The Holy Priesthood would be the ones to light the menorah lamps in the Tabernacles Holy Place twice a day, morning and night. Interestingly, the menorah and fragrant incense are always mentioned together. When Aaron lit the lamps he would also burn fragrant incense on the adjacent altar (Exodus 30:7-8). Mount Moriah shows us the location of The Temple. Abraham was directed to sacrifice his son, Isaac there and Isaac’s son, Jacob, would sleep there and understand it to be the place of “the house of God, and this is the gate of heaven.” Genesis 28:14. The promise that “in thee and in thy seed shall all the families of the earth be blessed” marks the site of the future Temples where the menorah would stand as a symbol of the Divine Presence. This location is also where the ‘Suffering Servant’ came in the 80th Jubilee of the earth. Yeshua Jesus was on the earth in 17 AD which ended the 80th Jubilee. He would hang on the Roman stake as the 81st Jubilee began probably dying in the year 27 AD…as that probably was a Shemittah year, which shows release. He released over 500 captives when He defeated the grave. He then walked the earth for another forty days and left on Iyyar 26. The new Temple is described as not having a court for the Gentile. That time is done and mankind should now be ONE in The Messiach. All will come together in The Torah because their hearts recognize that the Creator Elohim himself came and died for all their iniquity (violating the Torah). He died for the penalty of sin (violating The Torah) which is spiritual death. There are two branches on either side of the Menorah. Olive branch leaves are silver underneath and glimmer and shine with light when the stirred by the wind. These branches on either side of the menorah really become eight branches of ‘light’ forming the Hanukiah–the eight-branched menorah lit at Hanukkah. Let’s now look at Zechariah 4:11-14 to see who God says are these two extra branches. The first branch is even called, The Branch. He is G-d in the flesh of whom came as, ‘The Suffering Servant.’ He was anointed with oil….died on a stake…and resurrected…returning in the form of the Ruach HaKodesh (Holy Spirit). This Olive Anointed-Branch man resurrected on the 40th Day of the Counting of the Omer, Iyyar 26. Ten days later on the 50th Day of the Counting of the Omer, Sivan 6 (?) Elohim manifests in the form the Ruach HaChodesh (Holy Spirit) pouring into over 3000 human souls speaking to other in their own languages. Mankind has labeled this day Pentecost. Hebrew call it Shavuot. The second branch is yet to come. He is still G-d-in-the-flesh of whom is now known as, ‘King of Kings.’ He will establish the earth from Mount Moriah. He will choose the exact location as the mountain splits into three parts as His feet stand on it. All the man-made memorials will fall into the pit created by the earthquake and it will probably close itself back up as we saw in earthquake with Korach that showed false worship at Mt. Sinai. We have picture after picture described in God’s Scriptures. One of the most incredible thought-provoking scriptures hit me in this Day Three of Chanukah study. Are you ready to understand why the seven churches each have their own menorah with each having seven eyes of G-d on them? Revelation 1:12 “I turned to see who was speaking to me; and when I turned, I saw seven gold menorahs;and among the menorahs was someone like a Son of Man, wearing a robe down to his feet, and a gold band around his waist. He was the first branch on the menorah that suffered and now He is the last branch the reigns. 1:18 “the Living One. I was dead, but look! — I am alive forever and ever! And I hold the keys to Death and Sh’ol. So write down what you see, both what is now, and what will happen afterwards. Here is the secret meaning of the seven stars you saw in my right hand, and of the seven gold menorahs: the seven stars are the angels of the seven Messianic communities, and the seven menorahs are the seven Messianic communities. The one with the seven stars in his hand walks among the seven Hebrew communities. His eyes are on them. Each menorah has seven eyes each in the shape of an almond verifying that G-d is looking to see who is following The Torah. Revelation Chapter 2 takes us to the discussion to each of the Jewish communities. I will close here but we will continue to probe into the design of the menorah. The menorah always has a center ‘service’ candle which represents Yeshua Jesus. That center candle is lite first and from there the others are lite. The Temple had six tubes of oil servicing the menorah. Then eight lights were seen after the miracles at the time of Macabees with Antiochus Epiphanies in167-163 BCE. Israel today uses the six-branch menorah as it’s national symbol. The two branches on either side of the menorah represent Israel’s holy priesthood to the nations and then the incense altar representing our prayers being a ‘sweet aroma’ to the LORD. The Messiach coming is the new High Priest and He was a ‘sweet offering’; both being accepted on the Holy Altar of G-d. The seven-branched menorah represents seven years each; making a total of 49 years on a menorah. It is in the Jubilee that The Messiach releases the world. Even, in seeing the seven seven-branched menorahs we see one year on each branch again showing us 49 years with that final 50th branch returning the world to The Torah it once knew. This is what I want to study….as we begin the next year of year 6000. We are in the 120th year of history since Adom. Fifty years (1 Jubilee) times 120 Jubilees is 6000 years. This also is symbolic of six branches on the menorah with one left….the 1000 years….the millennium. We are close my friends…..1000 years to the ‘eighth’ branch (day). 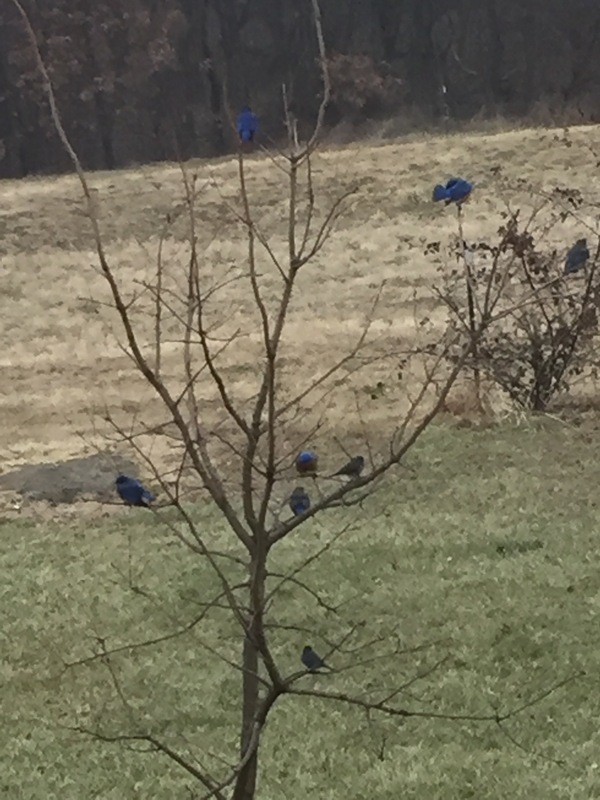 Update: On January 2 2016 I looked out my window and saw a tree menorah with seven cute blue birds on its branches. I grabbed my phone to get a picture. A few minutes earlier I had been laying under my warm bedcovers and my mind was pondering the seven lights of the menorah and if Adonai would reveal additional depth of meaning to me. These seven perfect little blue birds did not just represent the seven churches portrayed through the menorah, but creatures that were free to fly about, enjoying each other and yet in unity in their instruction on the earth. Our Creator gave them to me today to share with you. Gods Word is powerful and true just as these seven birds were my sign that our Creator shows us His light as they sat on the branches of this tree-menorah. Our Creator listens to our pleas and cares about every hair on our head just as He feeds His little bird-flock. His eyes go our seeking to see if man is obeying His Torah (instructions). I now see that Adonai gave us “8” birds to close out Chanukah. The center candle is Yeshua of whose light never goes out. He is the shamash (service) candle. Eight days of Chanukah ended last night. But we begin again as Chanukah is the conception of Yeshua Jesus who services us by giving us His way to eternal salvation. Let all the churches return to their first love, The Torah. Previous Previous post: Why on Christmas: 7.7 Chile EQ, Typhoon Philippines? Why on Chanukah Day One?